Bio: Aditi Majumder is an associate professor at the Department of Computer Science in University of California, Irvine. She received her PhD from Department of Computer Science, University of North Carolina at Chapel Hill in 2003. Her research resides at the junction of computer graphics, vision, visualization and human-computer interaction. Her research focuses on novel displays and camera exploring new degrees of freedom and quality while keeping them truly commodity, easily accessible to the common man. She has won three best paper awards in 2009-2010 in premier venues of IEEE Visualization, IEEE VR and IEEE PROCAMS. She is the co-author of the book "Practical Multi-Projector Display Design". She was the general co-chair of IEEE Virtual Reality 2012, program co-chair of IEEE Virtual Reality 2011, conference co-chair for ACM Virtual Reality Software and Technology 2007, general co-chair of the Projector-Camera Workshop (PROCAMS) 2005, and the program chair of PROCAMS 2009. She has played a key role in developing the first curved screen multi-projector display that was marketed by NEC/Alienware. She has advised Disney Imagineering for advances in their projection based theme park rides. 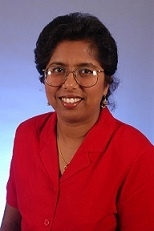 She has received the Faculty Research Incentive Award in 2009 and Faculty Research Midcareer Award in 2011 in the School of Information and Computer Science in UCI. She is the recipient of the NSF CAREER award in 2009 for Ubiquitous Displays Via a Distributed Framework. Our world continue to become more and more collaborative where we are expected to work in teams with collocated or remote members. Data is growing in size and complexity exponentially challenging us to create large-area immersive VR environments where they can be explored, edited or annonated by multiple collaborative users at the same time. Though the advances in personalized VR has been phenomenal in the past few years, the same cannot be said about collaborative virtual reality. This talk presents our work in progress at UCI in the past decade trying to push the frontiers on immersive large area collaborative VR environments. This talk specifically focuses on the aspects of high-quality ubiquitous displays, lucid collaborative interactions, novel VR data management and enabling high quality immersive environments that can be integrated easily in the presence of non-planar surfaces and low-quality devices. These technologies come together to provide users ubiquitous access to data, display and interactions forming an long-anticipated critical component of furture collaborative workspaces. Bio: Vitality Goncharuk is founder of Augmented Pixels - one of the leading developers of Augmented Reality solutions for retail, real estate and event marketing. Clients include National Geographic, KOHLS, Jayman, etc. In 2014 Augmented Pixels was nominated by the Financial Times for Boldness in Business Awards and became a winner @ Plug and Play Retail EXPO (USA). - Technologies and Best User Experience. Bio: Tony Diepenbrock is the CEO of Learn Immersive, an immersive language learning platform founded in December 2014. He graduated from the University of Pennsylvania in 2013 studying Science, Technology, and Society concentrating in Business and Computer Science. He is a recipient of the Citrix Innovator's Program grant, as well as a two time recipient of the Weiss Innovation Award at Penn. He holds two patents alongside his cofounder Charles Moyes. After graduating in 2013, he joined Hybris as a Software Engineer focused on front-end development. Abstract: For the last 40 years, developers have created experiences and games that rely on 2D panels, points, and other non-realistic features. Yet VR provides developers a new great power–the ability to give users a sense of presence. Given this, how can developers create realistic experiences and games without violating the “Principle of Presence?" 1. What is the “Principle of Presence?" 2. How do we avoid violating the “Principle of Presence?" 3. How do we amplify the feeling of presence? Introduction: HP® Sprout is a fully functional creative workstation that democratizes creativity with an intuitive, natural, sensory and immersive experience. An integration of PC, projector, and 3D scanner, HP Sprout’s breakthrough technology is designed to make creating and innovating as easy as possible. Combine the best of both physical and digital content—capture real-world objects in an instant, and then easily edit and apply them to your next creative project. We are going to demo the functions and possibilities of HP Sprout and invite the audience to have hands-on experiences. BAMMF is a Bay Area Multimedia Forum series. Experts from both academia and industry are invited to exchange ideas and information through talks, tutorials, posters, panel discussions and networking sessions. Topics of the forum will include emerging areas in vision, audio, touch, speech, text, various sensors, human computer interaction, natural language processing, machine learning, media-related signal processing, communication, and cross-media analysis etc. Talks in the event may cover advancement in algorithms and development, demonstration of new inventions, product innovation, business opportunities, etc. If you are interested in giving a presentation at the forum, please contact us.